When you’re looking for hearing aids to treat your hearing loss, it’s important to select devices that accommodate your lifestyle. Whether you enjoy frequent workout sessions and need hearing aids that fit securely or are looking for something that connects you to the technology around you, it’s important to weigh the pros and cons when narrowing down your options. Learn more about the various hearing aids you will be able to select from and what advantages and disadvantages they come with. BTE hearing aids are usually the largest of the devices, but are still available in many discreet colors and even mini options. 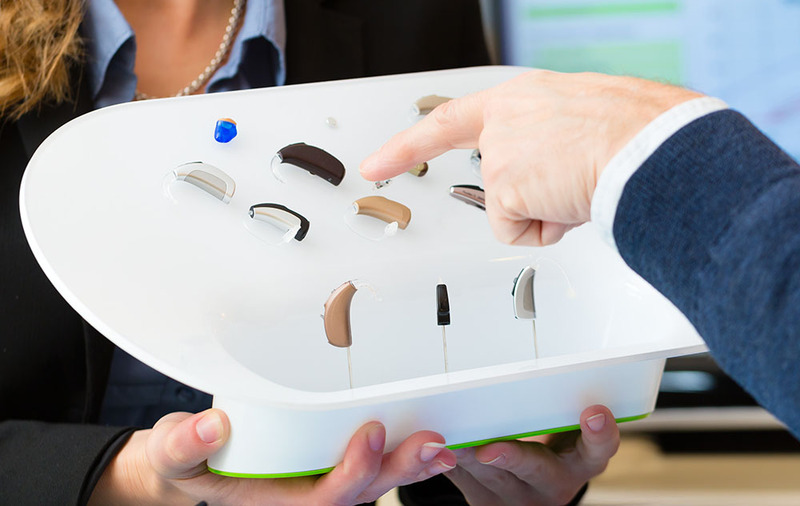 BTE hearing aids are comprised of different parts, including a plastic unit that houses the electronic components and a small tube that connects to the microphone in the ear. These are very common hearing aids and are suitable for all levels of hearing loss, ranging from mild to profound. They are surprisingly light as well, making them a good option for anyone new to hearing aids. Additionally, because of their larger size, they are simple to handle, which makes cleaning, maintenance, battery changing and insertion or removal much easier. They can also be equipped with several features, whether you’re looking for directional microphones, multi-settings, noise reduction or Bluetooth connectivity. ITC devices are some of the smallest hearing aids that we offer at Texan Hearing Center and they’re a popular choice because they’re barely noticeable unless you look directly at the ear up close. This means they’re fantastic for people that want to be very discreet with their hearing aids. They’re suitable for people with mild-to-moderate levels of hearing loss and are surprisingly powerful even when you consider their small size. ITC hearing aids are light, comfortable and available with multiple features, making them versatile for everyday use. Make sure to talk to your hearing instrument specialist about the features these can be equipped with to make sure they meet your personal needs. However, because of the small size of these hearing aids, if you have dexterity issues you may find these difficult to handle when inserting or removing them, changing the batteries or cleaning the devices. Much like ITC hearing aids, these fit perfectly into your ear and are barely noticeable. They are typically inserted by your hearing instrument specialist with a special tool that allows them to be positioned appropriately in the ear canal. Because of how deeply they sit in the canal, they offer a very natural listening experience and background noise is typically not an issue. They are recommended for individuals with mild-to-moderate hearing loss and can be equipped with the features most important to you. In terms of considerations to make regarding IIC hearing aids, it’s important to remember they’re not easily handled and will typically require the assistance of your hearing instrument specialist to clean and maintain. Additionally, because children’s ear anatomy is still developing, they’re not usually suggested for younger patients to avoid numerous refittings. ITE hearing aids are designed to go into your outer ear and they’re often more discreet unless you look directly at the ear. This means they’re excellent for anyone that wants a more hidden hearing aid, or someone that might want smaller hearing aids which are lighter and easier to wear. They can easily be adjusted and often come custom molded, which is something that our hearing instrument specialists can do for you at Texan Renew Hearing Center. They’re suitable for most people and can hold fairly large batteries, making them an excellent choice for even demanding users that will use them fairly often. Because of their location in your outer ear bowl, ITE hearing aids may be more readily felt by the wearer as opposed to other options. While not uncomfortable, this may be something you want to consider depending on the feel you’re looking for from your hearing aids. Finding the right hearing aids can be difficult without the help of a professional. Talk with your hearing instrument specialist about the models that are most suitable for your hearing loss, lifestyle and budget wants. They will work with you to find the best device to help you reconnect with the world around you again. If you want to learn more about the types of hearing aids available or would like to book an appointment with our hearing instrument specialists, please get in touch today to speak to one of our friendly representatives. You can phone us at (512) 667-6904 or schedule an appointment with our online contact form.